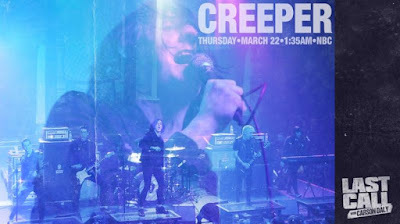 Creeper Makes Late Night Television Debut on "Last Call with Carson Daly"
Performances Include "Misery" and "Hiding With Boys"
Creeper made their Late Night TV debut last night with performances of "Misery" and "Hiding With Boys" on Last Call with Carson Daly. The episode was filmed in Hollywood, CA at The Fonda Theatre, where the band rocked a sold-out show in support of Neck Deep on "The Peace and The Panic Tour." In addition to delivering a massive and visceral performance, singer Will Gould jumped into the crowd at the end of their set to help crowd surfing fans, all while keeping a smile on his face. It was a true moment in their performance history and was captured on film for this Late Night Television Debut. Fans can head to NBC.com to check out the full episode, which is also streaming on Hulu. Currently in its 16th season on NBC, "Last Call with Carson Daly" continues to push the boundaries of late-night television. Host Carson Daly introduces his audience to the emerging artists and stories you simply won't find anywhere else. "Last Call with Carson Daly" is produced by Universal Television. Named as Best British Newcomer at the Kerrang! 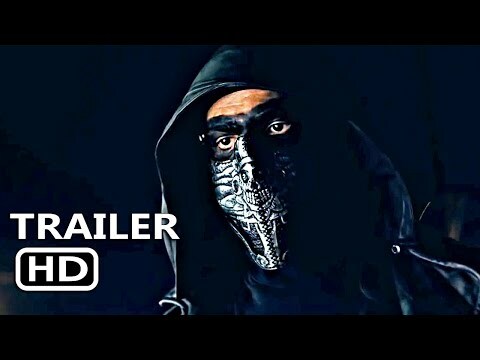 Awards, Best New Band at the Metal Hammer Golden God Awards and Best British Newcomer in Rock Sound readers' poll, CREEPER recently released their acclaimed debut LP, ETERNITY, IN YOUR ARMS, via Roadrunner Records. Eternity, In Your Arms is available at creepercult.com. Ostensibly a punk band, CREEPER's sonic palette draws on everything from Alkaline Trio and Jawbreaker to Meat Loaf, David Bowie and Queen. Throughout 'ETERNITY...', those influences are united by a rich array of orchestration - everything from trumpets and strings, to keys, spoken word poetry and close vocal harmonies.